In order to assess and monitor students’ decoding skills, vocabulary, and reading comprehension, we created three web-based assessments directly integrated into A2i: Word Match Game (vocabulary and word knowledge), Letters 2 Meaning (decoding and reading comprehension), and Reading 2 Comprehension (reading comprehension). The three A2i assessments are easy to access and administer and are adaptive. If a student answers a question incorrectly, they receive an easier item. If they answer a question correctly, they get a more difficult item. This means students only take the items they need to obtain a valid and reliable score. Thus, adaptive assessments provide a lot of important information regarding a student’s reading ability in a short amount of time. 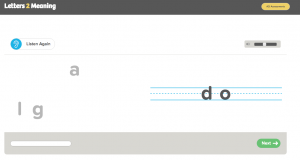 In addition, scores are available in A2i immediately, making them wonderfully convenient for teachers. Because the assessments are quick and can be administered frequently (every month) through the A2i website, teachers can use the A2i assessments to guide individualization and progress monitoring throughout the school year. It is recommended that the assessments are taken a minimum of three times per year. The Word Match Game is a semantic matching task (e.g., find the two words that go together) that student’s take individually on a computer. It assesses student’s vocabulary and word knowledge. 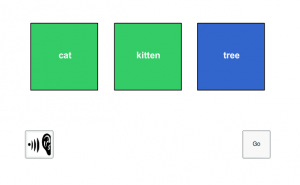 As students listen to the audio naming three displayed words (e.g., kitten, cat, tree), they will see the words appear in separate boxes that flash on the screen as the word is spoken. The student then picks the two words that go together (e.g., kitten, cat). Students are provided three training items and then are presented items based on whether the previous item was answered correctly or incorrectly. That is, the test is adaptive, getting harder for students getting answers correct and easier for students getting answers incorrect. Because of this, the assessment obtains valid and reliable scores in a short amount of time. Since students do not see the same items when they take the test, The Word Match Game can be administered monthly and is ideal for progress monitoring. Letters 2 Meaning (L2M) assesses students’ letter identification, letter sound identification, word reading, word reading, spelling, and composition skills. Students begin the assessment on different tasks, depending on their grade level. The assessment items become more difficult as students answer correctly. Tasks include selecting the correct letter by name or sound, selecting letters to build words, and selecting words to generate sentences. Like the Word Match Game, L2M is adaptive, can be administered monthly, and is ideal for progress monitoring. Reading 2 Comprehension (R2C) provides a measure of reading comprehension and is appropriate for students reading at a second grade level or greater. The students are asked to fill-in missing words with one of four words within a passage that they read. When they encounter the missing word, all four words make sense. It is not until they finish reading the paragraph that they can make the correct choice. Hence R2C taps inferencing and comprehension monitoring, which are critical for proficient reading comprehension. Although scoring is instant, R2C is not adaptive. Thus, it should not be administered more frequently than 3 times per year.